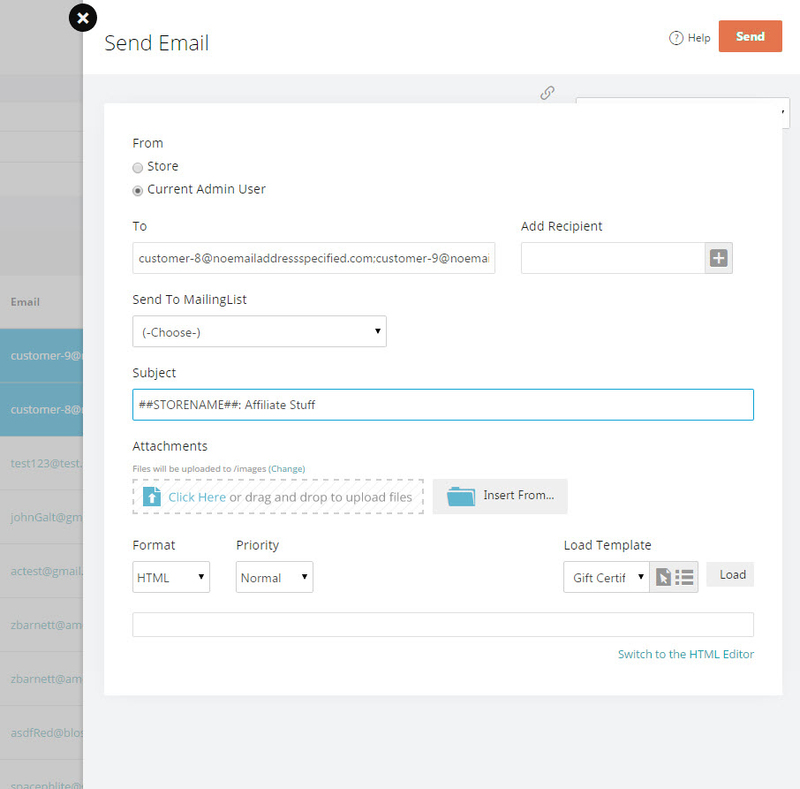 You can send emails to your customers from within the Admin Console. From Here you can select one or more customers that you wish to send an email to. If you want to filter your customer search results, use the Search Options. 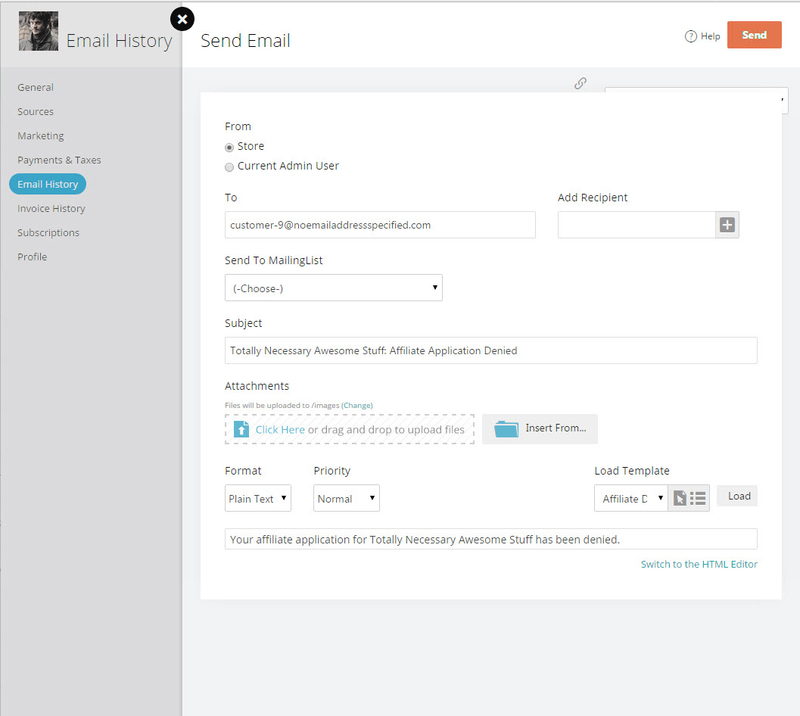 Once you select, one or more customers you wish to send an email to, you will click More Actions in the top right. If you select Send Email Template, you will select the email template you want to use. The selected email will be sent directly to the selected customers. If you select 'Write Email' from the list, you will be able to edit the template for this specific action and send from your email address. The screen shots below will show where the settings are located. Here is a screen shot of the 'Write Email' overlay. Select a template from the "Load Template" list and click the Load button to load the template content into the email editor. You can modify the loaded content as needed. Enter the list of email addresses of your customers to which you wish to send this email. To send it to multiple people, separate the addresses by a comma. Enter the subject of the email. You can use a combination of text and merge codes. In the large textbox you can enter the content of the email. You can use available merge codes in the body. Can be set to Normal, High, or Low. Choose between HTML or Plain Text content of the email. Enabling HTML will change the email content editor to show additional controls related to text formatting and other HTML options. If you have logged emails sent to a customer you can review them when you view the customer record. Click the Edit Customer icon for the individual customer. This will Bring up the Edit Customer Overlay. Click Email History in the left navigation. Click on the Subject or on the hour glass to view the email. Here you can review, edit or send a revised email from the customer's email history.